Nonprofits and church leaders overwhelmed by the daily release from federal custody of hundreds of migrant families have for weeks asked for local and state leaders to assist and support what they say is a humanitarian crisis. However, neither Gov. Doug Ducey’s office or City of Phoenix leaders have offered a plan to assist. Two Phoenix councilmembers punted the issue back to the federal government. U.S. Immigration and Customs Enforcement since October has released migrant adults and their teens and children to community groups in Arizona. Between Dec. 21 and March 5, 14,500 migrant adults and children were released in the state, according to ICE. While a network of churches coordinated with ICE to provide space to receive the families, the network has reached a breaking point from the emotional, physical and financial strain of the work. The situation was aggravated last week when Greyhound said it won’t allow ICE to drop off migrants on company property. Henry Lucero, who directs ICE’s enforcement and deportation operations in Arizona, told KTAR this week the agency processes up to 300 people for release in a day. On Wednesday, at least four groups of migrants were released at different times of the day onto a sidewalk near the Greyhound bus station by Phoenix Sky Harbor International Airport. 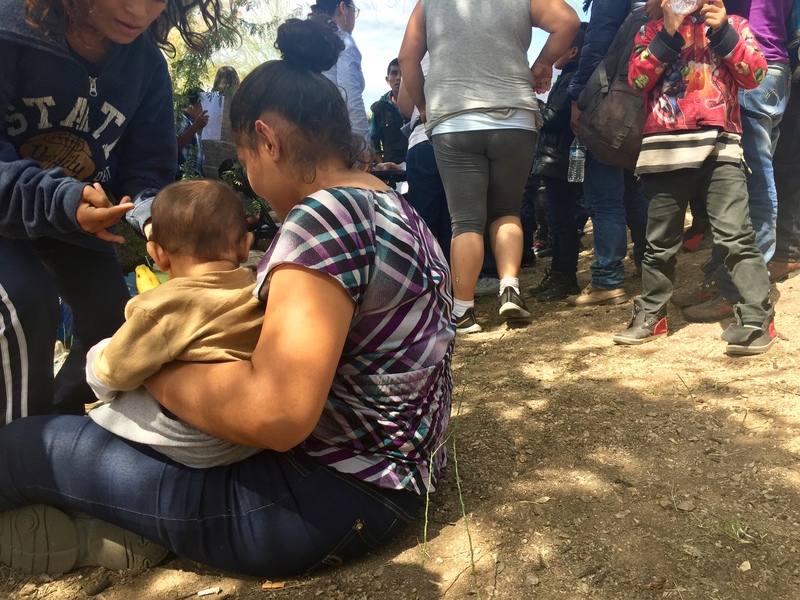 They were adults, teens and children — including a six-month-old baby and a boy with no shoes — from Guatemala, Honduras and El Salvador. “This is not a current City of Phoenix policy issue, but our city leaders are concerned,” Deborah Ostreicher, chief of staff for Phoenix Mayor Thelda Williams, told Arizona Mirror on Tuesday. Ostreicher said to follow-up in a couple of days when the new mayor, Kate Gallego, gets installed. Lisa Fernandez, who will be Gallego’s chief of staff, told the Mirror Tuesday that Gallego and her team aren’t prepared to give an “educated” response because they haven’t participated in stakeholder meetings. Gallego was elected March 12, and served on city council since 2014. A group of faith community members have also met with Gov. Doug Ducey’s office, spokesman Patrick Ptak confirmed. Wednesday at the Greyhound station, there were a handful of volunteers. None were organized under one charity group. Some held bags full of ham and cheese sandwiches. Another brought out jugs of Tampico powder juice to give the migrants. Two representatives from the Guatemalan consulate brought out a folding chair and small table and set it up below the soft shade of Mesquite trees. With nowhere to sit, the migrants stood or sat on the dirt. The Mirror also contacted Councilwoman Felicita Mendoza, who’s district covers the Greyhound station, and Councilman Michael Nowakoswki, who chairs the city’s Public Safety and Veterans Subcommittee. In a joint statement, Mendoza and Nowakowski said they are aware ICE has been releasing asylum seekers and that local faith and volunteer networks have responded to it. They called the situation a “national humanitarian issue” and called for action at the federal level. The City of Phoenix owns the parcel where Greyhound operates its bus station, and most of the land around it. Melissa Hubert, a volunteer, thinks city officials could do more. Hubert, 34, said she’s been hosting migrant families who need a place to spend the night while they catch a bus or a plane to meet their relatives elsewhere in the US. She learned of the need to help migrant families at the Greyhound station on Monday, when she was dropping off a family. She thinks along with more municipal involvement, more volunteers, businesses and nonprofits should step up. “These are people. My humanity comes first. I don’t know the perfect solution… but anybody could do something,” Hubert said. In empty warehouses, buildings etc. They are Trump people; HEARTLESS! I stand with my previous comment! What the city officials are not grasping when they say it is not a their issue, is that ICE has made it a city issue!! They have dropped a group of people who were in their custody and left them on a city street with no money, no food and no way to reach family. I know some homeless Americans who could use the help. They were here first, shouldn’t they rightfully be first priority?